The report nonetheless underscores the fact that if Côte d’Ivoire hopes to maintain this favorable trend, it must strengthen the foundations for its sustainable development. The seventh Côte d'Ivoire Economic Update (FR) confirms anew the country's sound performance since the end of the political crisis in 2011. The report nonetheless underscores the fact that if Côte d'Ivoire hopes to maintain this favorable trend, it must strengthen the foundations for its sustainable development, focusing in particular on managing its natural capital and taking immediate action to mitigate the impact of climate change. The challenge that lies ahead for Côte d'Ivoire is not only to continue its economic growth at an accelerated pace, but also to ensure that this growth is sustainable in the long run. The unrestrained use of its stock of natural capital could adversely affect its economic growth rate in the years ahead. Based on the methodology used by the World Bank's Wealth Accounting and the Valuation of Ecosystem Services (WAVES) initiative, natural capital per person fell by 26% between 1990 and 2014. While not as alarming as in Nigeria, this deterioration is nonetheless worrying, especially in comparison to several countries that have successfully enhanced their stock of natural capital. The extent of climate change and the lack of preparation by Côte d'Ivoire to address this phenomenon make the country especially vulnerable. Hotter average temperatures, far more inconsistent rainfall, and rising sea levels are already being observed. 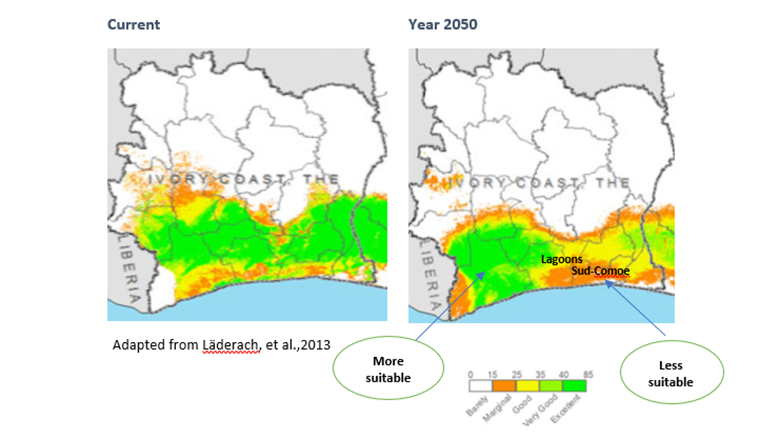 If no action is taken, sea levels could rise up to 1.2 meters in the Greater Bassam and Abidjan areas. There will be more flooded areas, leading in turn to heavy loss of life and the forced relocation of numerous families and economic activities. Infrastructure could also be affected by the loss of dwellings, roads, schools, and health centers. Agriculture, one of the drivers of the Ivorian economy, is highly vulnerable to climatic vagaries. Côte d'Ivoire is currently the world's leading producer and exporter of cocoa, which accounts for roughly one-third of export earnings and over 10% of tax revenues, and is the source of direct and indirect income for close to five million people. The sector will, nevertheless, be impacted by climate change effects, especially rising temperatures that could dry out the soil and reduce its fertility, forcing many farmers to move their crops to higher ground, where temperatures are more conducive to cocoa growing.